Handplanes #6: #7: confused? - good! 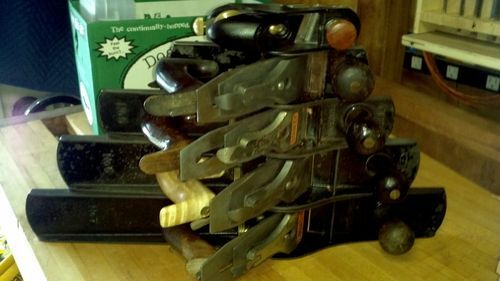 This post is about the #7 hand plane (Stanley #7) which is a jointer plane. it is the longest of the more popular hand plane (aside for the #8 which is heavier and seems less popular because of it’s added weight) and is used to joint edges flat and perpendicular to faces of boards, and to plane boards and panels flat. 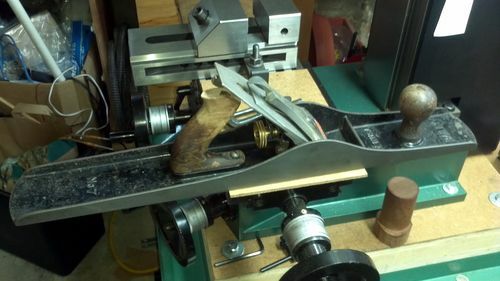 The longer bed of the jointer plane gives it a better reference when planing boards so that it isn’t affected by bumps and valleys as much as the smaller planes that sort of ride up and down on those high/low spots and by not being as sensitive to those it remains flat and takes off the high spots more evenly resulting in a flat surface over all. 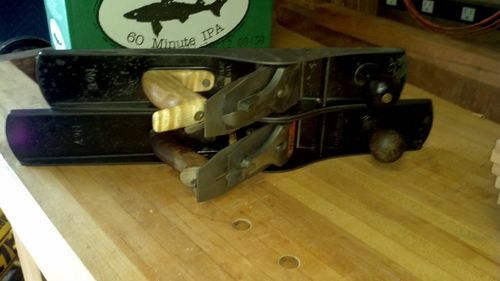 They say Luck comes to those who wait… and I’ve waited for a while now for a jointer plane while using a smaller #6 hand plane which worked OK for me, albeit with less of a bed length to register flatness against, but I finally found the affordable Stanley #7 jointer plane for me and snagged it for $15 off of eBay. 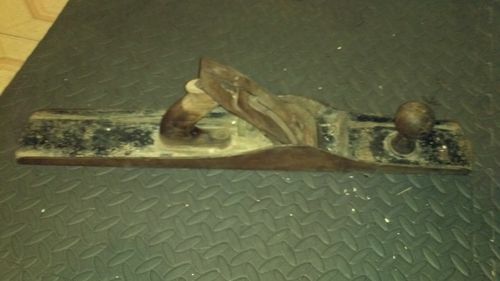 It was filthy, the back handle is broken like 90% of these hand planes, and the metal is somewhat rusty – not too bad. the pictures on eBay were pretty horrible, but I could make 2 things – broken wooden handle that is fixable, and metal did not have any signs of pitting/welding/breakage – a perfect candidate for restoration. it was dirty, and the bidding was low, and I assume because of he poor picture quality the auction did not get much attention – to my delight. someone did outbid my $10 initial offer, but nobody wanted to pay more than $15 for this – which was very good for me. There were still a few rust spots that I scraped off, and there are still a few that I might give it a 2nd treatment, but for now, it is good – next I’ll sharpen the blade, and give it the normal tune up. but I’m pleased with the find. I was concerned that a #7 won’t fit in my tool cabinet for length reasons, but as it is, it just barely fits in with 1/2” to space – PERFECT. I will have to reorganize the planes storage area (about time) to make room for all of them properly. but for now I think I’m done looking at handplanes, have all those I ‘need’. Coming along nicely. Great price on that. Did you make the tote for the #6, and if so are you going to use the same wood on the #7? Maple I am guessing? nice find, and treatment. are you going to put in a new blade? Thanks Shane, yes I did make the tote for the #6, but as much as I love that maple, I think it’s too light for a handplane (although as far as shape its the most comfortable one I have). Now that I have the ‘set’ I am thinking of making a matching set of totes and knobs for all of them from a single board (or at least matching material) and shape the totes to my liking while at it…. but not a necessity so much so, that for now I’m going to leave the broken handle on the #7 on it. Aaron – thanks. and I am planning on using the Sweatheart blade that came with the plane. unless it really performs poorly (which I doubt it will). my budget is limited and had to wait for a #7 at the mentioned price to even be able to afford it- it feel awkward spending on a blade (yes a good one) more than I did on the entire plane. FYI, I am using the factory blades on all of my planes ,and have yet come to a point I felt I needed anything better. blades are alway sharp and perform superbly. Umm, if you dont want that sw blade, I would gladly take it off your hands. : ) I am a sucker for rosewood, but having said that, there is never a reason why figured maple isnt a great option. LN uses it in saws. Walnut, cherry, bubinga, cocobola and many others make attractive options. You will have to post when you get them all matcing. but for now I think I’m done looking at handplanes, have all those I ‘need’. ha, thanks Jamie – I’m actually good with my statements. was only looking at planes once in a while waiting for that #7. did not spend any $$$ last year on tools at all. nor this year. I do not say much, but when I do – I mean it. Nice find, Sharon! You’ve given me the incentive to look here and in Phoenix for something similar! BTW, what is the mix of your electricity conducting solution? Great find at that price! You did the smart thing…. look for an ugly duckling, but one that has all the major parts and no broken metal. Pretty much everything else is fixable. eddie – I did it in my garage and just kept the door open for fresh air to circulate. doing it outside will also work. I personally like to keep it monitored. 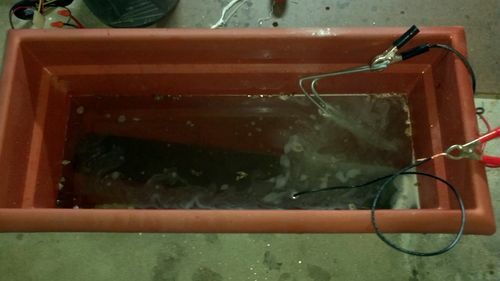 something that might happen is if the electrode will get caked and covered with rust, then it will not conduct electricity anymore (or not as well) and the speed of the process will reduce (or stop) at which point you can take the electrode out (after stopping power to it) and remove the rust from it using a wire brush, or replace it with another electrode. Sharon: I used pvc pipe with a cap on each end to hold a plane with evapo-rust. 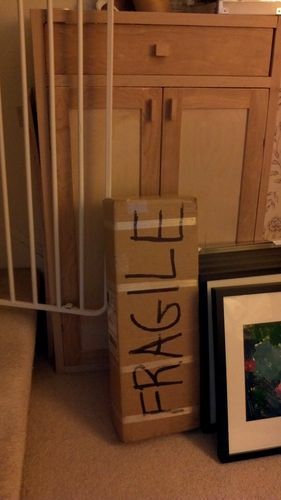 It did a great job with having to get a big container and a lot of materials.